Philippines, on Luzon, Cebu, Negros. Rain forest at low to medium elevation, sometimes on limestone. Moderatly robust herb to ca. 60 cm tall; stem ca. 2 cm diam. ; leaves few, ?1-3 together, often subtended by cataphylls; cataphylls papery, lanceolate, to ca. 11 cm long; petiole to ca. 45 cm long, sheathing in the lower third, sometimes maculate ; blade rather narrowly sagittate to narrowly hasto-sagittate, to ca. 35 cm long; anterior lobe to 24 cm long, ca. 11 cm wide at base, with 4-5 primary veins on each side of the anterior costa diverging at 45-80°; margin slightly undulate to entire; primary lateral veins somewhat prominent adaxially and abaxially, with incospicuous glands in the axils on abaxial side; secondary veneration arising from the primary at ca. 70-90° then deflected marginally, not or hardly forming interprimary collective veins; posterior lobes slender, about half the length of the anterior; posterior costae diverging at an obtuse (hastate) to acute (sagittate) angle, naked in the sinus for 1-2 cm; inflorescences paired or solitary; peduncle to ca. 20 cm long; spathe ca. 7.5 cm long; lower spathe ca. 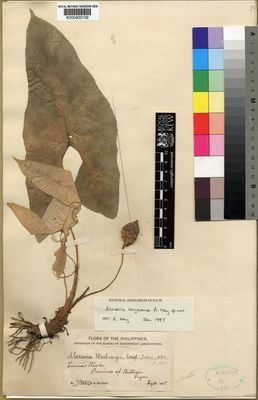 2 cm long, ovoid, seperated from the limb by a strong constriction; limb lanceolate, reflexed; spadix somewhat shorted than the spathe, stipitate for ca. 4 mm with the stipe partly adnate to merely obliquely inserted on the soathe; female zone 6-8 mm long; pistils subglobuse, ca. 1.5 mm diam. ; stigma subsessile, rather sharply 3-4 lobed; sterlie interstive about equaling the female zone, tapering distally, its top corresponding with spathe costriction; male zone ca. 12 mm long, clylindric, ca. 5 mm diam. ; synandria rhombo-hexagonal, ca. 1 mm diam., opening by apical pores not overtopped by the synconnective; appendix 1.5-1.7 cm long, tapering, composed of irregularly sinuate staminodes, slightly narrower than to equalling the make zone in thickness; infructescence broadly ovoid, ca. 2.4 cm diam.